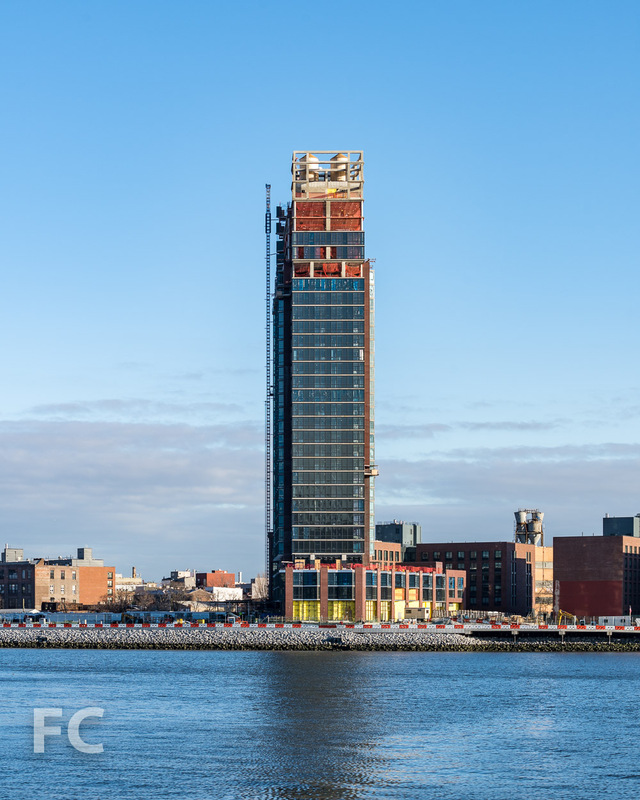 Installation of the brick and window wall façade is ongoing at 37 Blue Slip, the first market rate tower of the Greenpoint Landing mega project. The 30-story tower stands 300 feet tall and will offer 373 residential units when completed. The materials were selected to tie the tower into the neighborhood's industrial past and the adjacent affordable buildings in the development. North façade of 37 Blue Slip. Looking north on Franklin Street. Southeast corner of 7 Bell Slip (center), 5 Blue Slip (left)and 37 Blue Slip (right). Looking southwest on Commercial Street towards 7 Bell Slip (center) and 37 Blue Slip (right). Architect: Handel Architects; Developers: Brookfield Property Partners (37 Bell Slip), Park Tower Group (37 Bell Slip, 7 Bell Slip, 5 Blue Slip, 33 Eagle Street), L+M Development Partners (7 Bell Slip, 5 Blue Slip, 33 Eagle Street; Program: Residential, Retail, Education, Park; Location: Greenpoint, Brooklyn, NY.